Introduced as "One of the most respected and influential artists in popular music," a self -assured and graceful Joni stode on stage of the Ed Sullivan theatre carrying her new VG-8 guitar. Wearing a silk woven beret, layers of skirts, matching gold earrings and chocker, and leather vest, Joni appeared the antithesis of the highbrow downtown vagabond. Unaccompanied by fellow Canadian Paul Scaefer and his band, Joni established immediate intimacy. One of her most favorite songs to play because of the chordal movements, she launched into "Just Like This Train." Her voice, coy and charmed at first, gained strength as she slowly engaged the audience deeper into the descriptive passages of the song. Even though Joni had a slight cold, she sounded terrific. A brief thirty seconds with David Letterman, gained a chuckle from the audience as he asked, "What is the Misses about?" 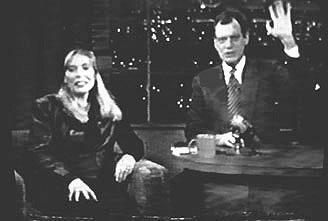 Joni responded, "Well the misses is like most of my career" Letterman said, "Nah, nah come on now." 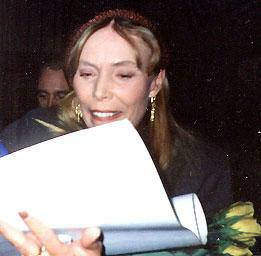 Joni said, "I'm not being self-effacing - it's what people missed". This performance could be described as one of warmth, intimacy, and retro-Court and Spark high profile grace. After the show, Joni stopped to talk to the folks waiting outside the theater. She also signed autographs and took pictures with fans while her entourage waited.